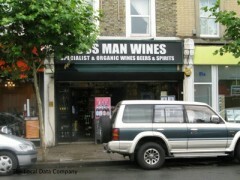 Craft beer, international ales, world lagers… Boss Man Wines is another off license with a beer selection to match its wine offerings. And the staff in the East Dulwich shop are always happy to help you find something new. "A great range of craft beer and rare wines"
Wine has always been a tipple people are willing to go hunting for but the craft beer phenomenon means now beer too is worth a little digging. While off licenses have always been the best places to look for specialist wine, pubs have always been the natural home of beer. In the past if you wanted something different then the supermarkets and off licences were unlikely to help. But that has changed, bottle shops providing exotic beers have sprung up over London and Bossman Wines, the small shop on Lordship Lane in East Dulwich offers one of the best ranges south of the river. Primarily stocking wine, you can find a varied range of bottles from independent growers and small vineyards. So if you’re looking to swap your Casillero del Diablo for something a little more unique, this is the place to find it. The shop sells a range of specialist and organic wines at prices from £5 upwards, so there is value to be found. Unfortunately, the same isn’t quite true for the beers. If you want good quality craft brews from independent and microbreweries then you’re going to have to pay the price. And the price is relatively high. We were pleased to see the likes of Brew by Numbers, Pressure Drop, London Fields Brewery and Kernel but slightly put off by the cost of the range of Belgian beers. There is no doubt that Bossman Wines have curated a fine selection of beers (and they will also do their best to order in specific brewery produce) and with knowledgeable staff in store you can always be pointed towards something new. The range of wine is impressive and if you’re keen to avoid the usual boring beer brands then go here. A word of advice: buy in bulk and you might be able to work out a discount.